Three is only a number, right? Just one of ten numerals that we use to express value, nothing more. Or is it perhaps a lot more? Is the number three a designer’s best friend? Does it drive art, photography, design, architecture and even the natural order of the universe? 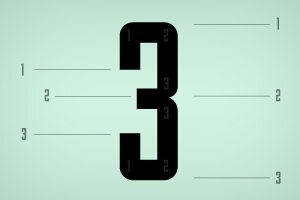 Join us as we take a look at some ways that designers leverage the number three, and more importantly, why you should keep the number three in mind whether you’re designing websites, print ads or even logos. Three is a magic number. It’s been a close and dear friend of designers for as long as anyone can remember. There’s just something about three that works across all mediums, all formats, all sizes. Three is beauty, three is symmetry, three is design. Take a look at TheBorsky.com and you can see the number three at work in multiple ways. The designer here has used three rotating featured images stacked on top of three columns of content. Examples like this permeate the web. The site Vizzuality.com uses the number three horizontally, vertically, and in a stacked distribution. As you can see below, a three column layout is used for image galleries and blog post previews. Not only does three divide pages into columns, it’s also used to split pages into rows. Here you can see three different featured products stacked on top of each other. Three takes a step towards abstraction here as the content is split up into two rows. You might not even catch that the number three is at work here, but it’s there, quietly hiding and presenting the content in an attractive manner. Do you see it? Three was guiding designers long before the web came around. Print designers were well acquainted with similar tactics. The ad below divides a square into three rows and three columns. There are also three primary paragraphs of text and three chess pieces. Think that three is limited to print and web design? Think again. Three is everywhere. In photography, the magic of three leads us to the rule of thirds, which tells us how to compose a visually pleasing shot. Of course, photographers merely borrowed the rule of thirds. Long before the first click of a shutter, brush strokes were guided by the same rule. Three is more than the power of thirds though. There are three points in a triangle, another powerful structure used by artists for composition. Da Vinci knew about triangles. Three doesn’t stop there. We build monuments to three. It’s everywhere in architecture. Some say the rule of thirds is really a lazy or inaccurate application of the Fibonacci spiral or the golden proportion. Many believe that the Fibonacci Sequence governs the natural world, hiding in plant life, seashells, tree branches and even the reproductive results of bees and rabbits. This conversation could go for days. Earth is the third planet from the sun, DNA is encoded using a triplet codon system, DNA is one of three major macromolecules necessary for life, there are three parts to the Holy Trinity, three people were crucified at Christ’s death before he was raised on the third day, Buddhists take refuge in Three Jewels or Treasures, there are three parts to the Hindu Trimurti… we get it, the world is obsessed with three! You could probably perform similar tricks with the number four, or even five or six. Why should designers give a rip? Whether three has any significance in the grand scheme of the universe or this is all merely a silly numbers trick meant to get you to see what isn’t there, the simple truth is that three is indeed a cornerstone in the concept of humankind’s perception of beauty and significance. As a designer, any time you’re faced with figuring out how to logically group items in a visual arrangement, the number three is there to help you out. The number three can make it easy to divide up a page, present a tiered pricing strategy, list your best features and even create a memorable logos. Some of the most famous logos around lean heavily on the number three. Is three the only solution for your design conundrums? Absolutely not. But it is an ever present friend that will always help you out of a jam. Three will never get old. It isn’t a design trend that will go the way of glossy buttons and reflections, it’s a constant in the world of aesthetics that you can always leverage for well structured design. Where Else Do You See The Number Three? The purpose of this discussion is not to stick you into a predictable design rut, but instead to open your eyes to the diversity of how thirds are used in the world of design. When this concept is burned into your brain, you’ll start thinking about proportions differently and more carefully considering the way you distribute items on a page. Remember that one of the most important aspects of learning a design rule is that those who know the rule best can break it with the most skill and tact. An interesting design strategy if you want to create something unique might be to completely forsake the number three in every piece of your design. Now that you’ve seen my many examples of how three is used in design, leave a comment below and tell us about your favorite examples. Have you seen the power of three in any logos or other famous designs? Let us know!